Headings on websites are extremely important for breaking up your paragraphs of content, and formatting your text. In this article we’re going to explain what they are, why you should use them effectively in your web pages, and how important they are for SEO. Most people will be familiar with the concept of headings from using Microsoft Word. You can choose a heading which briefly describes the topic of a section. Usually the Heading 1 will be the title at the top of your page, with subtitles using Heading 2, and subtitles of that section using Heading 3 and so on. Headings on a website work in mostly the same way, and you can have headings 1 to 6. This allows you to mark up headings and subheadings on a web page, in order of importance. The W3C recommends that ‘A heading element briefly describes the topic of the section it introduces’ so the words used in the heading should summarise what that next paragraph is about, like the headings in this article do. It also means that the order of the headings should make sense if someone is viewing your website without the stylesheet, and that it should look like a normal written document. This is how many disabled people will access your website. For example blind people will most likely navigate using a screen reader which reads out the text. The order of the headings should be in a way that makes sense, starting with H1 before all else. When you mark up text as a heading, you are effectively telling a search engine how important that text is on the page. Search engines will then use this information when rating your site in their search listings. For good SEO practice, you should always include your website’s keywords in your headings, so that the search engine understands that these are the most important words on the page. Remember that your headings also still need to be readable to your users, and they still need to make sense, so don’t fill them with all your keywords. This is called keyword stuffing and Google will penalise you for this. 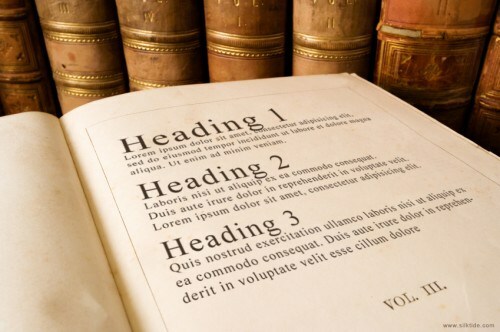 The Heading 1 (or H1) is the most important piece of text on your web page. There should only ever be one H1 on each page, which is used to briefly describe the page – it’s essentially the name of the page. The H1 should also be unique for each page, as it’s meant to describe the page, and not the website. For example your ‘Contact Us’ page would logically have the H1 of ‘Contact Us’. We’ve seen some examples of websites using the H1 as the name of the website, so that the text is not unique on each page. This doesn’t help search engines, who won’t know each page’s unique content. Google will also mark your website down if each page has exactly the same H1. Browsers have a default style for each heading element, which is a reason why many people use a H2 when H1 is too large. You can get over this problem by using CSS to style each of the header elements to the size that you need. Previous Previous post: What should my website’s bounce rate be?